Most people believe their home is a safe haven! However,homeowners are blissfully unaware that the frequently forgotten attics and crawl spaces are a hotbed of potential dangers such as mold, toxic gases, pests, wood rot and other harmful allergens. Protecting your home against these hazards isn’t quite as hard as it seems. Regular inspection and proper maintenance can rectify the longstanding issues in these dark and dingy functional areas. Since it is a messy job, calling in a professional is the preferable solution. Quartz Solutions is the best in this domain. We have the experience and expertise to tackle any attic and crawl spaces related issue, and provide you with a comfortable living environment. Neglected attic and crawl spaces are vulnerable regions that provide a conducive environment for a range of problems to flourish. If not addressed quickly, these issues can cause extensive damage to the inside of the home and its very foundation. Wet and humid areas trigger the silent growth of mold, fungus, and mildew. Gradually, the dangerous spores seep into the indoor air, which can have serious health implications. Excessive exposure to wetness can cause wood decay, compromise the foundation walls and cause structural damage. 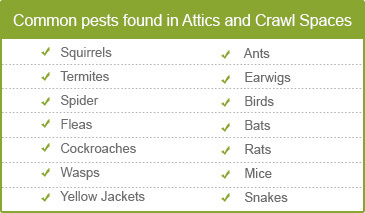 Bats, mice, rodents, and squirrels are a menace that creates havoc by destroying all the systems. These animals also leave behind droppings which leads to germs, bacterial growth, and infections. Pests, termites, and other four-legged insects like spiders, flies and ants are carriers of germs. Worn out air ducts and a damaged insulation system reduces energy efficiency. This can inflate utility bills. 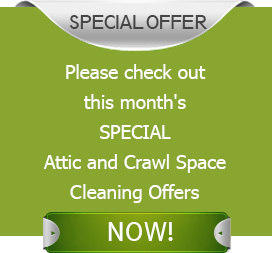 A meticulous inspection of the attic and crawl space by professionals goes a long way when you are looking to keep a comfortable, clean and hygienic home. We at Quartz Solutions are perfect for this task. Our skilled team will conduct a free appraisal of the space, complete with testing for the toxic Radon gas. Once the situation is evaluated and dangers identified, the experts will chalk out a cost-effective plan to eradicate them. Depending on the condition, if the area warrants a clean-up, Quartz Solutions will take up the task in a methodical manner. Salvaging stuff that can be reused from the waste will be the top priority. Next, the faulty insulation, dead animals, droppings, useless wires, broken air ducts and debris will be removed. This will be followed by a sensitization and decontamination process to eliminate all traces of viruses and bacteria. Quartz Solutions is a highly professional enterprise that delivers quality service at the best market rates. Customer satisfaction is our main concern. Quartz Solutions for Attic and Crawl Space Services in Summit, Union County, NJ. ZIP : 07901, 7902. Summit is a small town of around 21,000 in Union County. With affordable housing, great schools, good access to highways and convenient commute, Summit is basically a wonderful place to live.We also want to pitch in to help keep the attic and crawl spaces of this township in top shape. Call Quartz Solutions at 973-536-1013 for a complimentary consultation and inspection!